The front line in the war for Ukraine has stabilized. As the two sides rebuild, combat patrols cause trouble on both sides. In a NATO salient in the Russian lines, enemy forces have been continually cutting the Main Supply Route with platoon and company sized elements. For the past several weeks, your air assault infantry company has been tasked with clearing these roadblocks, using your high mobility to quickly reach trouble areas. 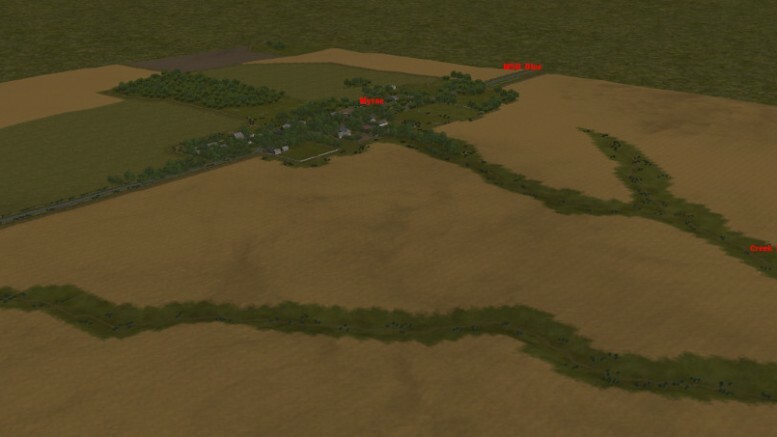 This morning, infantry with several BMPs in support infiltrated through the gaps in our lines and occupied the village of Myrne, which sits astride the MSR. Your company was assembled and flown into an area north of the village. Take your force and clear Myrne of the enemy. 3 Comments on "AD Myrne Roadblock"
AD – you really do make the best scenarios – and especially maps out there…. Rating **** This is an excellent small scenario, with US infantry only. By using good infantry tactics you can win. (Not saying how = spoilers). You will need to pay attention to fire discipline or you will run very short on ammo. My only criticism is that I felt the town had way too many trees – it was like fighting in Lothlorien or somewhere :-).